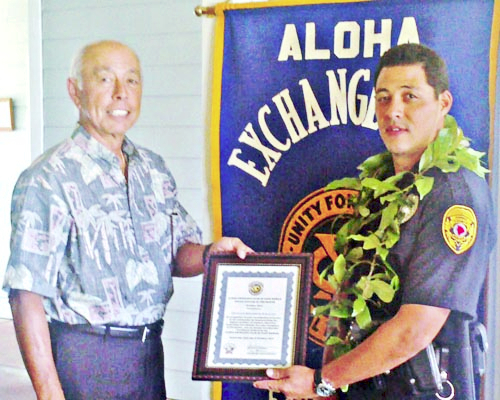 Hilo Exchange Club member Joey Estrella presents an 'Officer of the Month' plaque to Officer Bronson Kaliloa. The Aloha Exchange Club of East Hawaiʻi recognized Officer Bronson Kaliloa on Thursday (October 25) as “Officer of the Month” for October. Kaliloa was honored for using his investigative skills to solve a burglary. 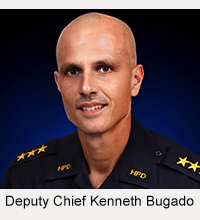 On July 14, Officer Kaliloa was assigned to a report of a break-in at a home in the Nanawale Estates subdivision. 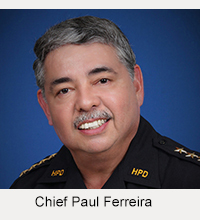 Earlier, at a briefing at the start of his shift, he had learned that a suspect in numerous other Puna burglaries had been arrested for several traffic offenses after a collision and that the man’s car had been towed from the accident scene. At the scene of the Nanawale burglary, Kaliloa noticed similarities to burglary cases involving the man arrested for the traffic offenses, so he pursued that angle of investigation and developed enough evidence to obtain a search warrant on the crashed car. Inside the car, police recovered several items belonging to the victims of the burglary in Nanawale Estates. The suspect was charged with burglary and theft. His bail was set at $35,000.